Congratulations to our 2019 Lei Court! Kapolei – Congratulations to the 2019 Lei Court! Nicole Aiko Punahele Makamae Kahi ‘O Mililani Nakamatsu was crowned as the 91st Lei Queen, and is joined by First Princess Brittanie-Kristina Corpus and Princess Naiya ʻĀnelamainālanikuakaʻa Kuwaye-Naehu. Nakamatsu of Mililani is an ‘Iolani School graduate and alumni of the University of Washington where she majored in biology. She was first taught how to make lei by her late grandmother and has been dancing hula since she was four years old. She aspires to be a physician who treats her patients with aloha. Corpus of Kāneʻohe is a Maryknoll School graduate who is pursuing a nursing degree at the University of Hawai‘i. Like Nakamatsu, she began dancing hula at the age of four. Through hula and her passion for hiking, she has enhanced her love of lei and lei-making. The trio was selected as part of the Lei Court Selection ceremony held in the courtyard of Kapolei Hale Saturday. Along with dancing hula, each contestant was scored on lei making, English and Hawaiian speaking, poise, and personality. 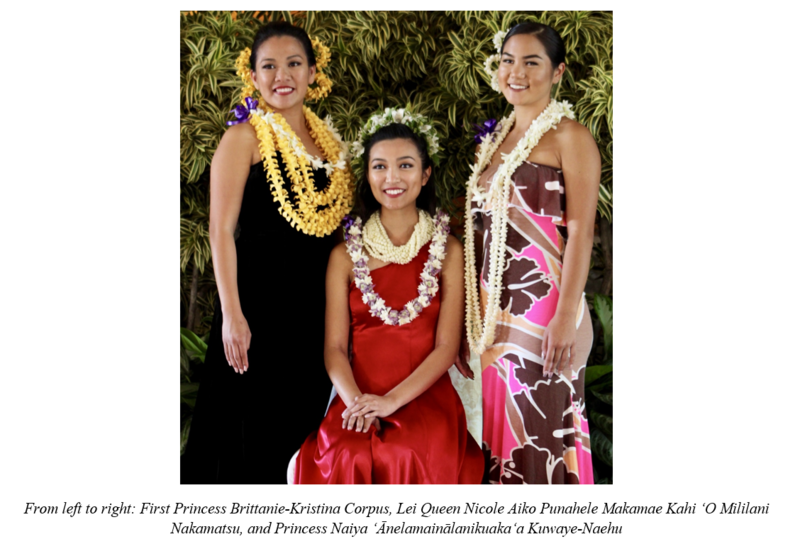 The new Lei Court will preside over the 92nd Annual Lei Day Celebration festivities, and will be the city’s Ambassadors of Aloha at a variety of public events. 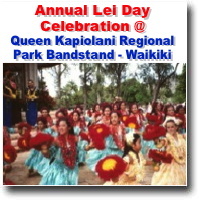 The Lei Day Celebration will be held on Wednesday, May 1 at Kapi‘olani Park from 9 a.m. to 5:30 p.m. The theme for the celebration is Lei Kahakai (seashore lei).